It is argued that the first Infographic was way back in 1626, when Christoph Scheiner published the Rosa Ursina sive Sol, a book in which the Infographics were illustrations demonstrating the Sun’s rotational patterns. Nowadays graphics that share information are a normal part of our daily lives and visuals help inform us wherever we turn. Dailyinfographic.com produces an Infographic everyday and some books are almost entirely made up of information graphics, such as David Macaulay‘s The Way Things Work. As a visual learner and advocate of the power of visuals, Infographics help us to sort and bring order to complex information and I can see how they can form a major part in educating our students in a wide variety of contexts. Growing up at school my first love was always Art but coming a very close second, surprisingly was Mathematics. Ever since I was 12 I knew I wanted to be a Graphic Designer, yet one of my strongest subjects at school was Maths. I still love to problem solve, so understanding visual data seems the perfect combination of my passions. I sometimes describe myself as a mathematical artist, as many of my drawing methods are concerned with proportions, measuring or designing with regard to symmetry, emphasis or balance. 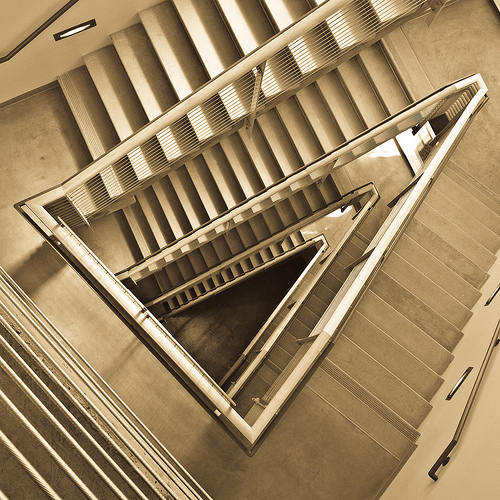 One of my idols in the Art world, who successfully combined these 2 disciplines was MC Escher and, as a teenager I marvelled at his fantastical and surreal compositions with perspective and his tessellation designs. I have been teaching students about the fundamentals of design theory for over 20 years and in the application of the elements and principles to drawing, photography and composition as well as in the basics of good Graphic Design. My current visual notes graphically document my learning and communicate information in a similar way that Infographics and Data Visualisation work, yet I had not made that connection until just recently. I simply use visuals combined with text, as that is the most effective way for me to learn, recall and remember. Back in 2008, I was teaching an eager group of IB Visual Art students in Ghana, who were keen to involve their home culture more into their personal works. We talked about the current issues faced in Africa and globally that might inspire meaningful work and eventually discussions and research centred on the corresponding statistics. 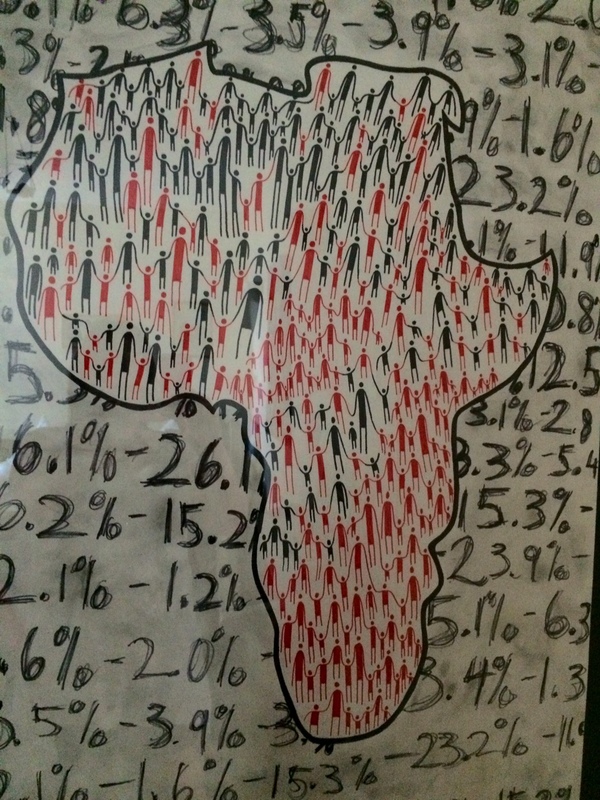 Each student found an authentic statistic on their home country to communicate through visual means. 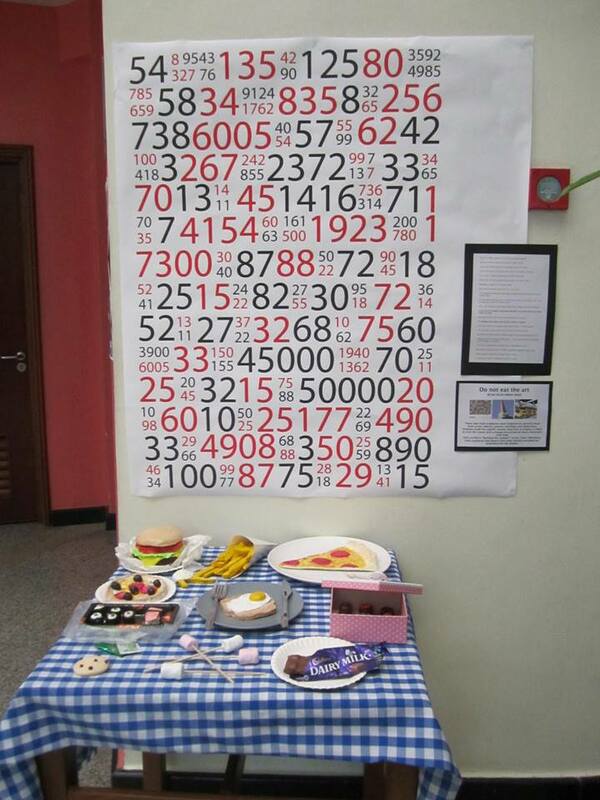 Whilst a Swiss student looked into the amount of chocolate eaten in one year per person another student was astounded at the numbers of HIV deaths in certain areas of Africa and set out to visualise this data. Was this my first taste of working with information and graphics in an educational context? As a Graphic designer years ago, I saw companies represent their annual statistics or data in simple graphs or tables with just colours or pie charts but not much more creatively than that. Today we see data represented in the most beautiful and weird ways. 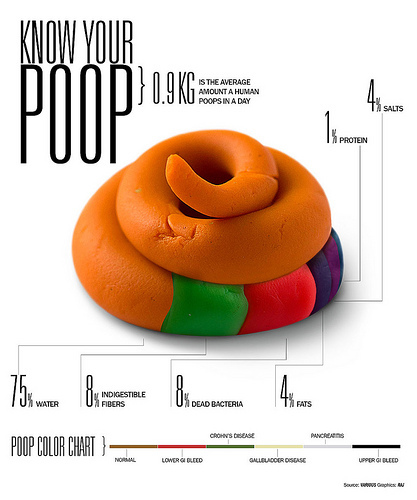 From how much sleep we should have to the contents of your poop! Designers have never been so creatively challenged to find the best and aesthetic way to interpret numbers and facts. I first came across Infographics, the image dominant designs we know them now as, when Noah Katz introduced the concept of visualising data to my Art Department back in 2010 and the concept struck a strong chord. Maybe it was then that the idea to bring together my Graphics background and the education of others began to take seed. I loved the idea of using facts and figures together with Design to help others to understand more abstract numbers or complex concepts. But data itself is a complex thing and often a rather boring concept to some youngsters, so how can we make it more palatable and more engaging? I talked about Chris Jordan’s complex data driven photography in a previous post (The Power of Visuals) and I was first inspired by his work back in 2009 in Ghana when researching for a GIN (Global Issues Network) conference in Qatar that I was taking my students to. Mike Johnston, now MS Principal UWCSEA, introduced us to the power a visual, and in this case a video, can have in grabbing attention and hitting a message home, hard. He showed the shocking, yet painfully simple video that sends its message, and the accompanying data plainly – recycle. Chris Jordan’s photographic installations show us graphically the effects of consumerism, albeit focused on the US market, yet applicable to us all worldwide. Moving forward to 2010 at UWCSEA, I taught predominantly Middle School Art, yet I was also teaching Grade 3 Art. I decided to take a chance and show these youngsters Chris Jordan’s Midway video in the run up to the Junior School exhibition focussing on Plastic and recycling. The students were able to communicate the issue visually yet also the message clearly in their explanations and even now, many years on they remember the message well. The environment and man’s impact on it has long been a passion of mine and in particular the problem with plastic pollution. Chris Jordan’s series Running the Numbers is still a fundamental part of my inspiration as I search for meaningful as well as achievable ways to change thinking in Singapore, a society with a huge throw-away culture. I would love to create a similar large scale mural of waves or the oceans made from thrown away plastic. It would be great to pull the community together to complete the mural over time, each contributing to this collection of everyday plastic, and in turn to see what a terrible effect plastic is having on our waters, much of which give forth to the Asian diet rich in fish. Could the Art department help save our world or at least change thinking and affect action? Where does data feature in the MS curriculum? 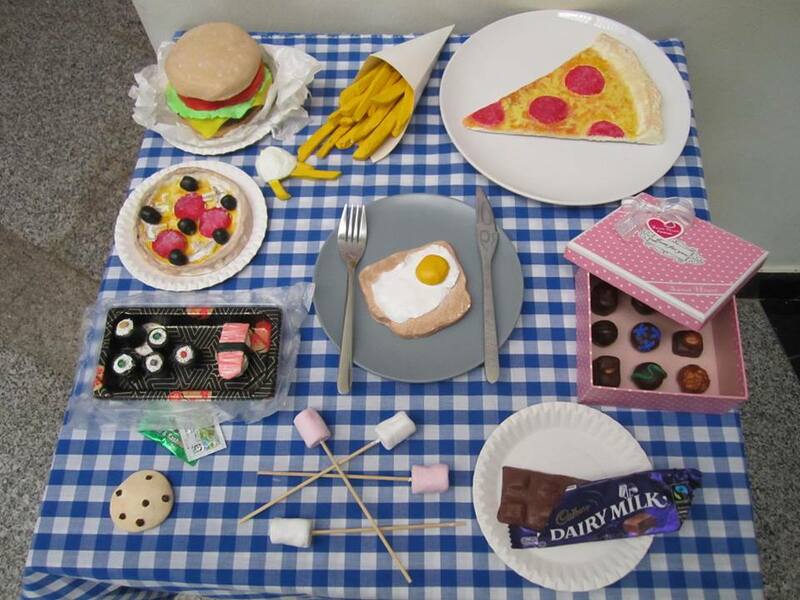 Last year my Grade 8 students were looking at issues with food to inspire their ceramic sculptures and found statistics that linked to this unit Food for Thought installation at the end of year exhibition. Although the point was visually communicated, I feel now that I missed an opportunity to bring in Infographics to the unit or at least link up with another department to develop these to support the sculptural work. Art collaborating with Maths? Whatever next?! What about this year? What ideas do I have? As part of my Global Concerns group PAW (Promoting Animal Welfare) we will be looking initially at endangered species and the decline of certain animals in our region and searching for effective ways in which to communicate this to the community to raise awareness. Perhaps Infographics would be a cool visual way to start this off? Just over a year ago I was privileged to attend Kelly Grogan‘s Extended session at Learning 2 Singapore, “Visual Literacy and Big Data Infographics”. Through her 3-hour session Kelly helped us to think of how we could infuse Infographics into our classrooms and how to make our own. She cross-referenced Noah Katz’s Visual Literacy session and the importance of understanding layout and the use of colour. It is clear in the examples that follow that Visual Literacy and the principles behind CRAP design are crucial in understanding the information presented. 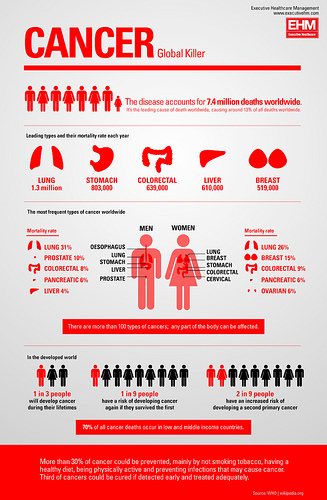 The Infographic to the left about the Global killer Cancer, shows careful, balanced use of symbols and data to communicate the message effectively but using a limited palette of colour to emphasise key points. 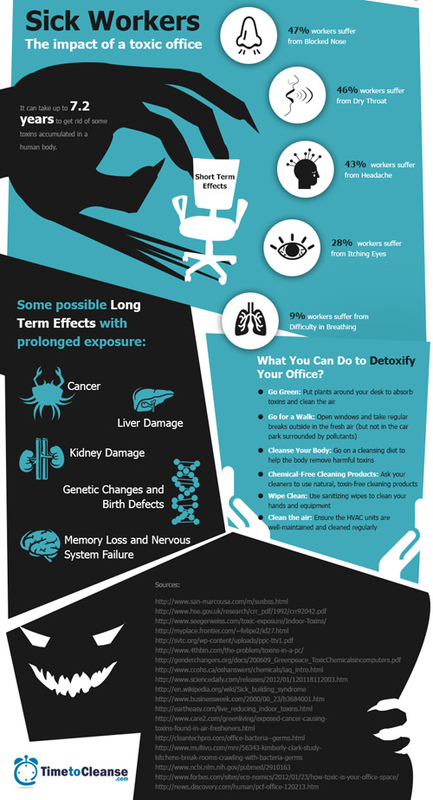 So too does the graphic on the right about the impact of a toxic office on workers clearly using contrasting values and simple iconography to capture the points also in a linear format. 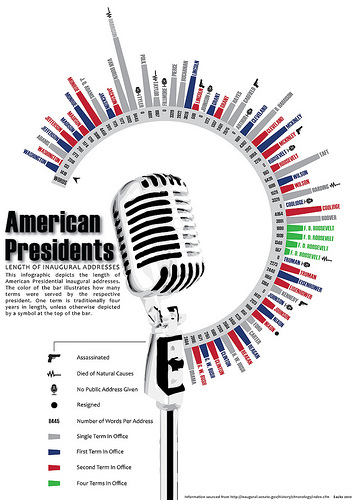 Other Infographics may use more of a timeline design working from left to right to track information logically showing the main message or more creatively in the example of American Presidents. But sometimes less information results in a clearer message, as in Gemma Bussel’s interpretation of the Creative Process. I know I couldn’t agree with it more! David McCandless talks about how “Information is Beautiful” in his book and website of the same name and, in his TED talk he calls information overload “Info Glut”. He explains how Infographics help us to ‘see” through the information and help us to sort and understand it more easily. Examples these days range from simple data represented logically using symbols and icons to complex and visually explicit examples such as Langwitches Visible Thinking Routines. What story is it telling? What pattern should I use? 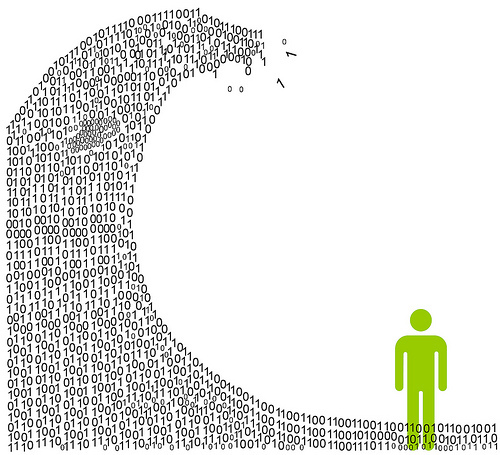 What data do we need? There are many websites these days that can help you to make your own Infographic (and links galore at Kathy Schrock’s Guide to Everything). But you don’t really need a dedicated app or website to make one yourself as everything is available on software such as Pages, you just need some creative thinking, a simple approach and the data itself. Information can be overwhelming but occasionally data can also be inaccurate or just plain wrong and it is crucial that we know first that the data is correct and that the source it came from is reliable. Once we establish this and have filtered and sorted it, we can look at the best way to use it and create something visually understandable and clearly communicable. Start small, think context, then design – what is the big message? Often when I am creating my Visual notes I have to sift through much information before deciding the main message to get across and then decide what the main points are that I want to communicate. It is in this same process that an Infographic can be developed. What is the message? What do you want to say? How can this be shown more visually? How might you sort the data or information? How can colour and layout help or hinder this process? Start with something you know to be true. For example: How many cups of tea (or coffee or even water consumption) you have in a week, month, year or what percentage of your food is sugar or how much exercise you take in a week. Convert this big message into a visual by taking your own photograph to form the backdrop, much like the Poop or cups examples above. You could use simple symbols from flaticon or the noun project to visualise the individual points, add in some text or data and hey presto an Infographic is born. Try it with your students – what do they know about or what interests them? Get them to create the data and there you have authentically sourced Infographics. Then share them online so others can benefit from your visuals too. 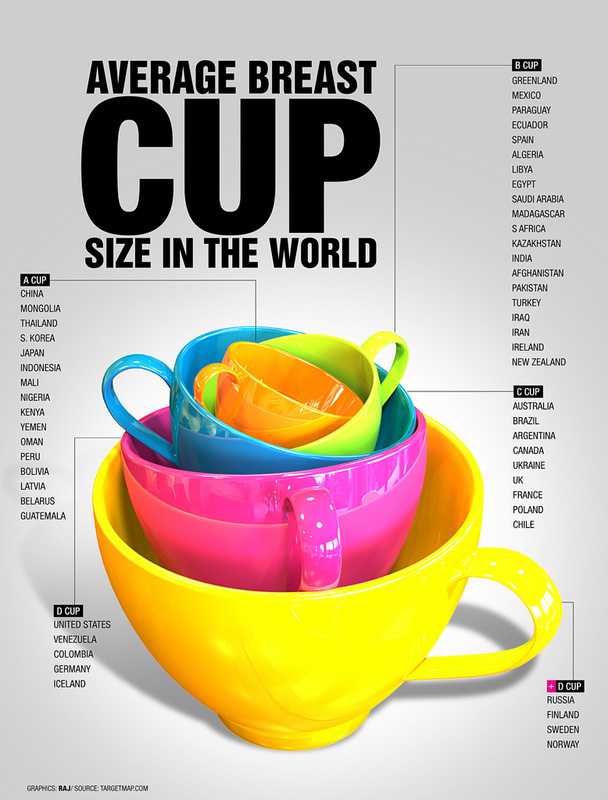 Flickr has a wonderful range of Inforgraphics here if you are not sick of them yet! Think how can you interpret other information more visually – the minutes of a meeting, the steps in a unit plan or the details or characters in a book? It may take you or your students more time to create in this way, but if you keep the concept (and the drawings or images) simple, and the structure clear, it will prove invaluable for retaining and recalling the information over time. Trust me, I know! My talk in Bangkok a few weeks ago depended on this statement and all 92 slides helped me to remember what I needed to say to the audience at Learning 2 without the need for notes or a script. And, if you’re interested and have just over 5 minutes to spare you can see a version of it for my final assignment in the final blog post for Course 3. I really like how you talk about your process. Seeing your work, I think some people get intimidated when they see your work so it’s great to see the depth of thought that goes behind it, as a way for us to get into it. As always incredible infographics and images. I do spend a lot of time working through the idea to take it from concept to outcome and, being a perfectionist it can take longer than the actual blog post! Thinking back to a comment from a workshop participant about my “pretty” images, I am considering doing a step by step video or infographic about the process of creating one of my works. It has literally taken years to develop my particular style and approach and maybe people are not aware of the commitment I have made to this over time to get to this stage that I am at with it. I wonder if students, and maybe adults too, would find some specific guidance useful when starting out with visual notes. What do you think?